Are transcription jobs some of your favorite work at home opportunities? Do you work well under tight deadlines and can meet or exceed them? Would you like to do transcription on an as-needed basis? Then Daily Transcription might be the right work at home fit for you. What Exactly is Daily Transcription? 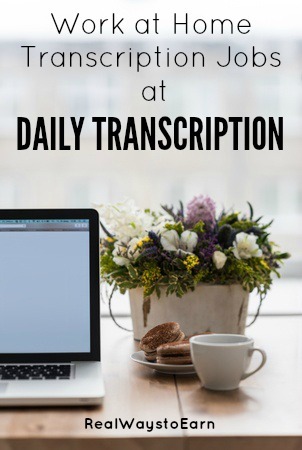 Daily Transcription is a work at home company that provides transcription on a daily basis to the legal, corporate, academic, and entertainment industries. Usually in the entertainment industry, clients have come to expect and to need daily transcription services. This is where the name Daily Transcription comes from. The company also offer translation services in 12 languages besides English. What is the Pay and When is Payday at Daily Transcription? The pay will vary depending upon the type of file the client submits. Here is what the clients are paying, so that should help you establish an estimate of what to expect. It also appears that pay is every two weeks via PayPal. What Are the Computer Requirements for the Transcriptionists at Daily Transcription? an updated computer and laptop with anti-virus and anti-malware protection. connection to an online thesaurus and an online dictionary. connection to Grammarly or any similar grammar/spell-checking program. a foot pedal is usually helpful, but not always required. Daily Transcription also provides a guideline for their transcription work. Can you Work For Daily Transcription Without Experience? Their website states that they are always looking for professional and novice transcribers, so it appears you may not need experience. However, the application does request that you attach your resume. You will be tested on your transcription skills prior to being accepted to work for the company. Are You an Independent Contractor or an Employee at Daily Transcription? At Daily Transcription you are an independent contractor and responsible for your own taxes. Most independent contractors only work part-time at Daily Transcription, since it operates on an “as-needed” basis. Should you make over $600 a year, you will be sent you a 1099 Income Tax Form. What Are the Hours at Daily Transcription? Some transcribers work part-time and some work full-time for Daily Transcription. The work can be done on your schedule as long as you are attentive to details and deadlines are met. Just as it is with most transcription companies, continual work is not going to be a sure thing. It states plainly on Daily Transcription's website that they are not able to guarantee a certain amount of work every week to any transcribers. So if you get accepted to do work for this company, you should make sure you have other “eggs” in your basket just in case there are dry spells. Can Workers Outside of the United States Work at Daily Transcription? Currently the company only accepts applicants located in the US and Canada. How Can an Interested Applicant Apply to Daily Transcription? Go to this page and get started. Good luck to all who apply.